In the smart grid/smart meter era, data integration strategies that enable analytics and optimization can transform how utilities view customers and provide many opportunities to boost returns. 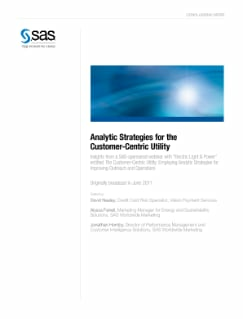 But to achieve a customer-centric orientation, utilities must be able to: Find profitable growth opportunities. Optimize marketing communications. Maximize cross-business impact. Based on a SAS-sponsored webinar with Electric Light & Power, this paper can help utilities understand how to approach this fundamental change to their business.